Many people are desperate for balance wanting to know how to make it through even just one day without feeling completely exhausted. This feeling tends to come with each passing season in a person’s life. When I was in high school, I had a few moments of stress while trying to figure out how to be a good student, hang out with my friends, have a job, and participate in my extra-curricular activities at school. For the most part it was fine, but sometimes they would all need my complete attention at the same time throwing me off kilter. In college, I felt unbalanced most of the time. Between having a job and school there wasn’t much extra time for anything else. I always took the maximum hours each semester, and I worked full time as well. I felt stress most days during those years and never really found the balance others appeared to have. Whether you are a student, leader, mentor, or mom, I bet you’ve hit one of those desperate moments at some point. You know the moment I’m talking about—the one where you don’t think you can continue on because there’s not enough of you to do all that’s required. It’s the point where you realize you don’t have enough time to really help others, and when was the last time you did something for yourself? Maybe you’re at that point right now. Last year, I realized I was at that point when my youth girls would ask to meet somewhere to catch up, and I always declined because my schedule was so jam packed. Two things hit me: 1) I loved these girls and wanted to be there for them but never had the time to be there, and 2) The message I was sending them was that I had things to do that were more important than they were to me. WAIT A MINUTE! That was not okay with me. These girls have always been and will always be high priority on my list, and I knew I needed to make some changes. When I took a look at my schedule, I realized that even though it was filled with ministry and work duties (things meant to benefit others), I wasn’t able to give my all to any of it. Not only that, but there wasn’t a second of my schedule devoted to me, which means I was pouring out but not being poured into, and I wasn’t able to be replenished mentally or physically. Several years back, I searched for the secret to balancing everything. It wasn’t until a couple of years ago that my pastor let me in on a little secret—a balanced life is not what I really want (or need for that matter). There is no secret to a life of balance. Say What? That’s right! My pastor said that to us during a message, and I thought he was telling us there’s no hope for feeling relief. I was wrong. Forget the Balancing Act – Let’s Dance! How do you feel about dancing? I love to dance. Even when I don’t look right doing it, I still love it. And although my husband is not the best dancer in the world, I’ve learned that he’s a closet dancer. He’ll dance at home with the kids, and sometimes I catch his head moving to the music while he’s driving. There’s probably something you do to keep the beat while listening to music, and you maybe don’t even realize it. Even if that’s all you do—you’re dancing! I’ve recently come to know someone who can dance like that’s what she was born to do. I’m in awe of how her body can move to music. Her movements are fluid, and as the music changes, so do her movements. She has rhythm. A few years back, our pastor did a series about rhythm vs. balance. He pointed out that when something is balanced, it’s also stagnant. It’s not moving because if it moves, it falls out of balance. The key is to find a rhythm that works for you. Having rhythm in your life rather than balance allows for you to make adjustments as life calls for it. Your life will not be exactly the same every day forever. Keep your movements flowing so you can continue on without tripping and falling. Just like dancing, when you find the right rhythm in life you know it because you can feel it. It’s aligned with the music. Everything flows more smoothly. It doesn’t mean you won’t have any “hiccups” along the way, but you’ll be more graceful when you reach them. A person balancing breakable plates on both hands and their head are focusing on the balancing act. They don’t want to drop and break the plates, so they miss out on everything going on around them. They aren’t able to do anything other than balance those delicate plates. A person dancing to the rhythm of the music playing in the background can change the dance as the music changes. They can dance alone or with others around them. And finally, take a look at the person balancing the plates versus the one dancing. Who looks like she’s enjoying herself more? Take time today to change your way of thinking. 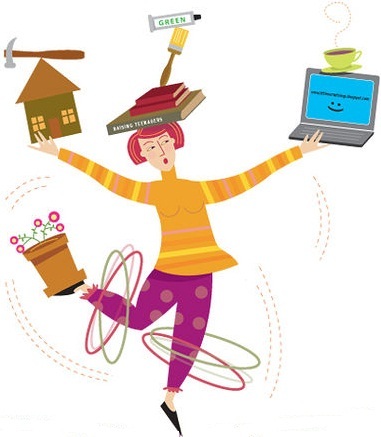 How can you make your life less of a balancing act and more of a dance? Do I really want a life of balance? Some days, yes 🙂 But, I like your emphasis here, and think you are right. Did Jesus have a life of balance? Or Paul? Neither did. They gave full energy to what they felt called to do. How can you explain Jesus’ ministry of redemption and Paul’s ministry or reconciliation on the basis of balance? You can’t.